The construction of the membrane is a Thin Film Composite (TFC). It is the ones of the highest quality membranes available in the industry. The reverse osmosis pressure vessel is a heavy-duty housing made of corrosion resistant fiberglass. Pre-Filtration System: dual stage inside two PVC housings. 25 micron in the first stage, 10-micron cartridge in the second stage. 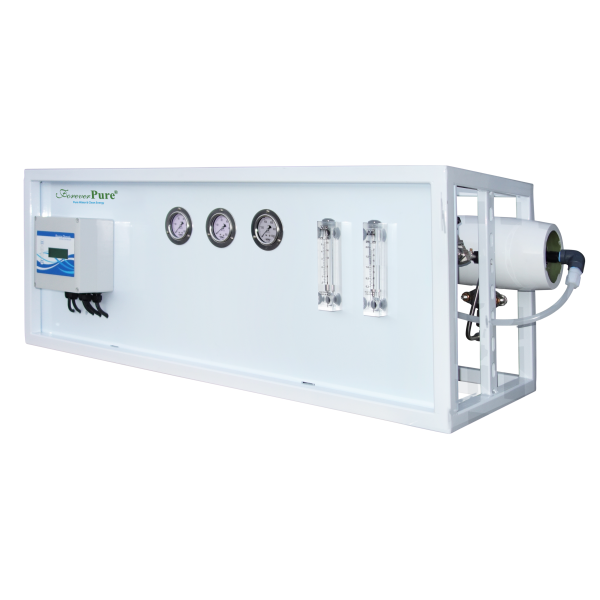 This system further reduces suspended solids in the feed water stream to RO system. It protects the RO high-pressure pump and lead end RO membrane elements from debris. 5 GPM rating. 1 No. Membrane Housing: fiberglass,4" housing, holds 1 membrane, 1000 psi rated pressure vessel, 1 No. Motor (220V/50hz/60hz/single phase): 2 HP,1.5KW TEFC. System controls (automatic operation): Microprocessor control to provide start/stop, sequential, and alarm control.